No one could have quite expected Infosys, the darling of the Indian IT industry, to be caught in corporate governance mire, that too close on the heels of the ignominious events at the Tata Group. There is some similarity between the way things have panned out at India's largest industrial house, and the country's second largest IT services company. In both cases, it was two business icons, who came out of the shadows post retirement to ostensibly "set things right". In Ratan Tata's case, he had the backing of the Tata Trusts, which holds over 60 per cent stake in Tata Sons, the holding company of the Tata Group. The Tata Sons board, which was reconstituted by Tata with a few new faces, also backed him as he ousted Mistry from the company's helm, citing under performance. 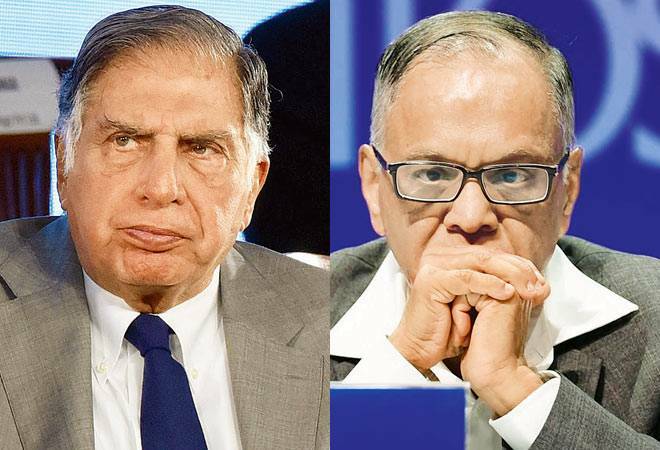 However, the case with Narayana Murthy, who has come down heavily on the Infosys chairman R Seshasayee and the company's board citing corporate governance issues, is different. He and the others such as former finance head V Balakrishnan who have alleged misgovernance at Infosys, hold small individual stakes in the firm (19 individuals hold a little over 12 per cent), where over 80 per cent stake is held by the public. In that sense, Murthy and others cannot wield any power other than that of influential stakeholders, whose views need to be considered seriously. That explains why Murthy and Balakrishnan have decided to air their views in public, unlike Tata who preferred to play boardroom battle in the initial stages, and not a full-fledged war through the media, until Mistry took issues to the press. The Infosys founders allege high severance package to former Chief Operating Officer Rajiv Bansal and a breakdown in the "values" at the IT major leading to a lack of effective communication with stakeholders as major issues to be addressed right away. And going by the ferocity of the attack, they may not back off unless they see Seshasayee resign as Chairman, and have some new faces as independent directors on Infosys board. While the governance issues don't seem to be as serious as Murthy alleges (unless he is privy to information on some serious cover-up taking place in the company following Bansal's exit), it is clear that the iconic co-founders and the present board do not seem to agree on many things. The board would like to believe the co-founders are unnecessarily interfering in the operations of the company, which has shrugged off some of its inertia ever since the high flying Vishal Sikka was brought in as CEO. There is merit to this argument too. The company has decided to pay its CEO an exorbitant salary, but that is truly in line with international norms currently, and Infosys, just as its other peers, is fighting its biggest ever battle to remain competitive in a world quickly transforming to automation and depending more on the internet of things and artificial intelligence. However, someone needs to give a patient hearing to the cofounders, and include their suggestions, wherever possible in the operations of the company. Only that can save it from a public disgrace that is quite unbecoming of Infosys.